Ovarian cysts are the most common intra-abdominal masses found in female fetuses and neonates. To date, the prenatal detection rate for neonatal ovarian cysts (NOC) is more than 30%. Although spontaneous regression occurs in more than half of prenatally detected NOC cases, complications of fetal ovarian cysts include compression of other viscera, cyst rupture, hemorrhage, and, most frequently, ovarian torsion with consequent loss of the ovary. Management includes both watchful expectancy in utero and postnatal or antenatal aspiration of large simple cysts, to prevent torsion and ovarian loss. Prenatal monitoring of recurrent complex cysts and postnatal follow-up in the case of simple cyst recurrence are mandatory. Surgical intervention should be considered only in symptomatic or complex cases. 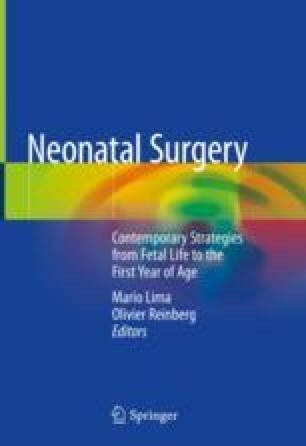 When a surgical intervention is pursued, an ovary preserving approach should be emphasized for all types of cysts, regardless of size, complexity, or presence of antenatal or postnatal torsion. The author thanks Dr. Calcaterra V. of the Pediatrics and Adolescentology Unit, Department of Internal Medicine and Therapeutics, University of Pavia, Italy, and Dr. Re A. of the Pediatric Radiology, Children’s Hospital, ARNAS Civico-Di Cristina-Benfratelli, Palermo, Italy.